This is the Goou-jinja Shrine in Kyoto. Located on the front of the Hamaguri-gomon Gate in the Kyoto Imperial Palace. The enshrined deity is Wake no Kiyomaro and his older sister named Wake no Hiromushi . Kiyomaro was to protect the imperial line, even while being sentenced to banishment. And, he has contributed to the establishment of capital of Heian-Kyo. There is the Kiyomaro's statue and picture of Hiromushi. There are a lot of things to be named after the wild boar, including Guardian wild boar in the precincts. 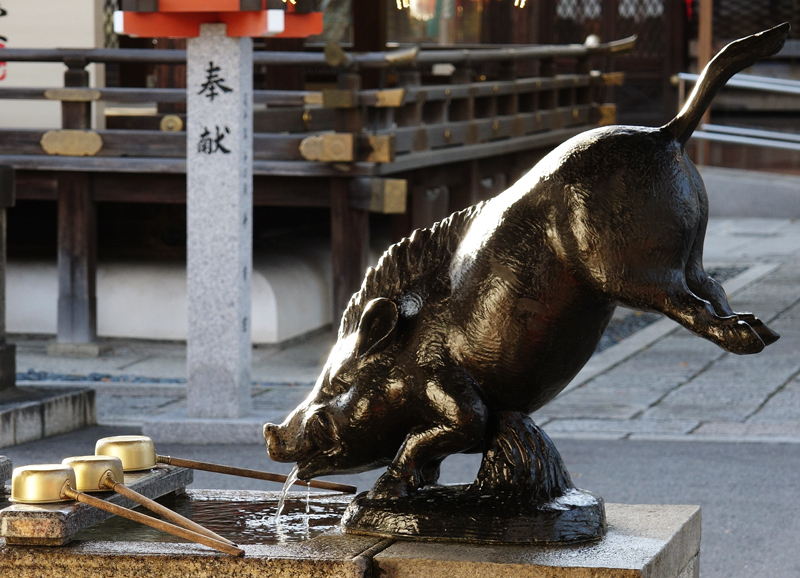 This shrine is also known as the boar shrine. This is due to a legend that When Kiyomaro was attacked by a thug, he was saved by 300 heads of wild boar that appeared suddenly. At this time, his injured leg has been recovered enough to walk by the patron of wild boar. From this legend, Kiyomaro has been faith even as legs of guardian. The outer wall of the shrine, Kiyomaro and wild boar themed picture and old ten yen bill that his Portrait and wild boar and Precinct is printed has been decorated. Precincts is not so widely, but there is giant Chinese quince tree and large pebble in addition to the wild boar. Here is a shrine where you can enjoy even after the visit.